Simply put, we are confident that Bloom Law can significantly increase the value of your personal injury recovery. We spend an inordinate amount of time developing a unique strategy for every injury case. No two cases are alike, and they should not be treated that way. We delve into the minutia of every accident case in order to extract maximum compensation from insurance companies. Every component of your case is evaluated, from the reputation of the judge to the skill of the defense attorney. We educate our clients on how their personal injury case, insurance coverage’s, and court proceedings work so that the victims we represent can make informed and strategic choices. 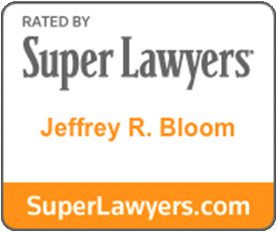 Bloom Law was founded by Jeffrey R. Bloom, a trial attorney who has spent his entire career serving accident victims in Maryland and Washington D.C. Mr. Bloom is unique in that he has a wealth of trial experience and success. In the past decade, he has gone to trial with hundreds of cases before courts across Maryland and in the District of Columbia, and has recovered millions for his clients. For years, he has been rated by Super Lawyers for his excellence in serving injury victims in Washington, D.C. and Maryland. Please review Mr. Bloom’s credentials and case results for more information. Representing people who have been injured in car accidents is our bread and butter. Jeff Bloom has handled hundreds of car accident cases in Maryland and Washington D.C. Bloom Law has handled complex medical injury cases involving compression fractures, herniation, disc bulges, and ligament tears. We’ve also handled hundreds of cases involving typical car accident injuries such as whiplash and muscle strains. If you have been injured in a car accident, please contact us for a free case evaluation. Bloom Law represents accident injury victims all across the State of Maryland and Washington D.C. We handle car accidents , bicycle accidents, medical malpractice, wrongful death , motorcycle accidents, and food contamination cases. Because we are familiar we the insurance companies and insurance defense attorneys in Maryland and D.C, Bloom Law believes it can add value to your accident cases. If you have been injured in an accident, please contact us for a free consultation. Wrongful death cases are among the most difficult and upsetting cases that our firm handles. Candidly, Bloom Law appreciates that there is nothing we can do to minimize the despair caused by the loss of a loved one. We can, however, take one devastatingly difficult issue off your plate in these trying times by handling any claim you have against someone who has caused the death of a family member. No amount of money will bring your loved one back and no amount of money will make you feel better, but it is crucial that you investigate any wrongful death claim you may have. While we cannot correct the ultimate loss, Bloom Law endeavors to make sure that we take financial care of the people who the lost family member would want to take care of. If you have lost a loved one due to another person’s fault, please contact us.